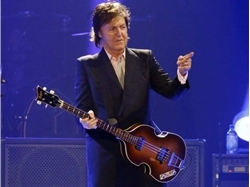 Paul McCartney’s stolen violin bass may be in Ottawa, new biography reveals. Beatles Radio: The Beatles, Solos, Covers, Birthdays, News The Fab 4 and More! It sounds outlandish, but the possibility that Sir Paul’s missing bass guitar is somewhere in Ottawa is raised in a massive new biography titled Paul McCartney: The Life by Philip Norman. The instrument, as much a part of the Beatles’ early image as mop haircuts and cuban-heeled boots, was played by McCartney throughout the Cavern Club era in Liverpool. Made by the Hofner company, the bass was stolen from the band’s Get Back/Let It Be sessions in 1969. Its whereabouts remain unknown — until now, presumably. There were actually two violin basses. The first, bought by McCartney in Hamburg in 1962 is the missing instrument. In 1963, Hofner gave McCartney an improved model as a reward for making the brand world famous. McCartney still plays the 1963 model at concerts, as he did at his 2013 show in Ottawa. It is insured for more than $4 million. The older instrument, referred to as “the Cavern bass” by Beatles historians, has never been recovered. The notion that it’s in Ottawa seems as out-there as the Paul-is-dead hoax started by U.S. college students half-a-century ago. Yet in the book, Norman relates how new information about the Cavern bass came to him from a trusted source — a Liverpool taxi driver named Peter Hodgson.